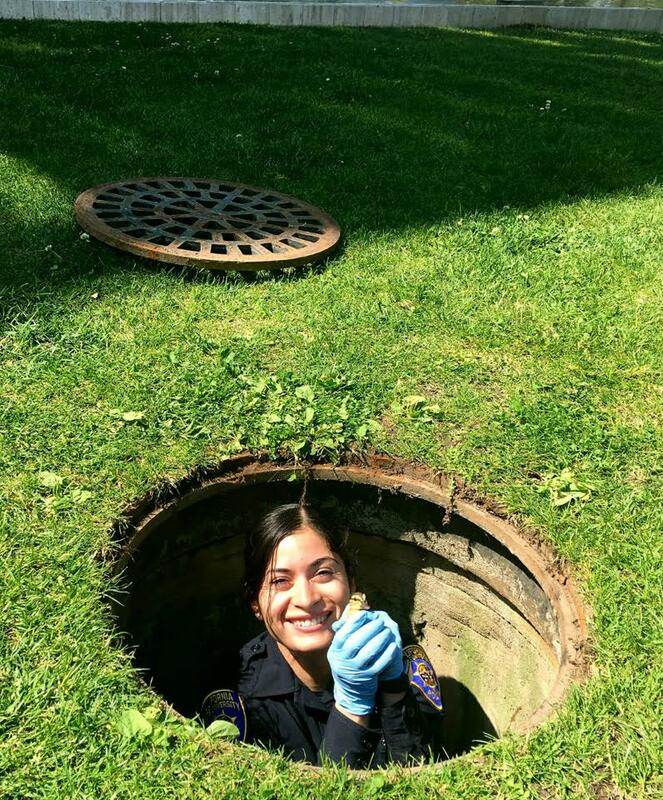 Officer Jennifer Sanchez in a manhole by Kurland Hall grabbing the last duckling. Photo courtesy of Christina Villalobos. The abandoned duckling that got left behind. Officer Sanchez, Officer Alexis Arellano and Sgt. Angela Voorhees and PPM staff used bread, a broom and cardboard to corner the duckling. Photo courtesy of Officer Jennifer Sanchez. Officer Jennifer Sanchez, first on the scene outside Kurland Lecture Hall on April 25 at 9 a.m., sized up the situation: frantic mother duck, pacing around a manhole, quacking for help, and seven little ducklings at the bottom of the manhole. Two other ducklings stood with momma duck, searching for their lost siblings. It must have been fate that Officer Sanchez answered the call — she’s the shortest person in the California State University, Northridge Department of Police Services, a perfect fit to squeeze down the 5-foot-5-inch drain. “This was my first duckling-in-a-manhole call,” Sanchez said. CSUN’s Physical Plant Management (PPM) employees assisted in opening the heavy manhole cover. Officer Alexis Arellano and Sgt. Angela Voorhees joined Sanchez at the scene. Officer Sanchez was able to lower herself into the drain once help had arrived. Underground, the ducklings found openings and waddled deeper into the crevices. 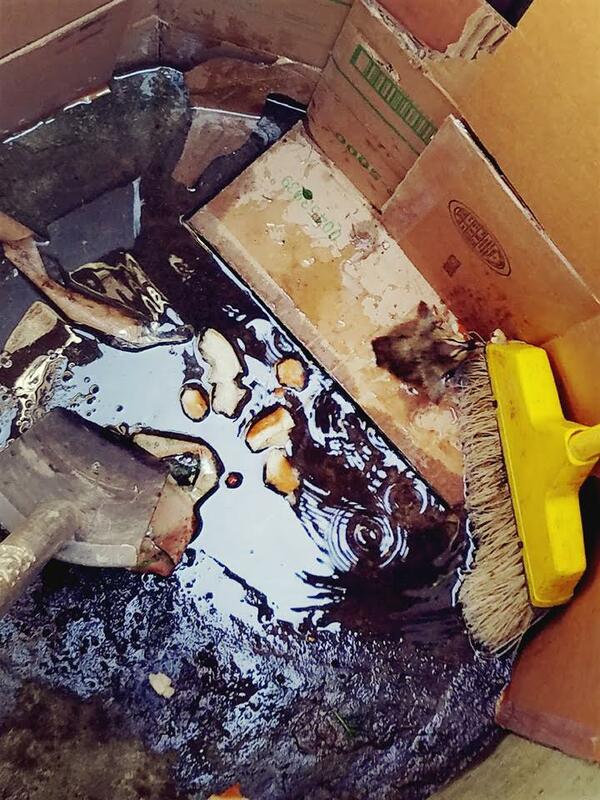 The police officers and PPM staff used brooms and cardboard to corner the ducklings, while trying to keep the mother duck and her two ducklings above ground — to no avail. Eventually, the two remaining ducklings fell in as well. At this point, the team of rescuers got creative, playing duck sounds from their cell phones and barking to get the ducklings underground to move. After struggling for an hour and a half, Sanchez, Voorhees and Arellano were able to bring up all of the ducklings but one. The mother duck took her ducklings and scurried off before the officers were able to rescue the last one — which took another hour. When they were finally able to capture the last baby duck, the mother duck and her ducklings were nowhere to be found. The team had to call City of Los Angeles Department of Animal Services to take the abandoned duckling. Sanchez said she became quite attached to the little one and wanted to make sure the duckling would be taken care of. Animal control staff assured her that the duckling would go to a wildlife sanctuary. When Sanchez got home that night, she had a good story.